There is no doubt that music has been bringing people together for thousands of years. If you are a music lover, you should definitely attend the Shenandoah Valley Music Festival. This set of outdoor concerts has become a summer favorite of locals and visitors alike! Grab your lawn chairs, some snacks, and a bottle of wine, then head to this event for a night of good music and fun. After you plan to attend the Shenandoah Valley Music Festival, plan the rest of your trip! Our area is filled with countless other wonderful attractions. For a complete list of handpicked, local recommendations, take a look at our complimentary Vacation Guide. This valuable resource has helped so many travelers plan unforgettable trips to the Shenandoah Valley, so get a copy today! The Shenandoah Valley Music Festival has been reaching their goal of bringing live music to the area for more than 55 years! Each summer, the not-for-profit organization hosts 8 concerts. Past performers have included Arlo Guthrie, Bruce Hornsby, LeAnn Rimes, and more. They switch up the music genres each concert, so find one you would enjoy, then book your stay at The Inn at Vaucluse Spring! The lineup is usually released during the spring, so make sure to check. The venue of the Shenandoah Valley Music Festival adds to its allure. The stage is outdoors under a pavilion in Orkney Springs, VA. Attendees will get to see gorgeous views of the Great North Mountain as they enjoy the music! The venue is on the smaller side, so guests are always guaranteed a good seat and a good time. If you purchased lawn tickets, make sure you bring some seating! Blankets, beach chairs, and lawn chairs are all acceptable. The event is set up into 3 sections: tallest chairs in the back, low chairs in the middle, and blankets in the front. This way, everyone can see! There will be food vendors, but you can also bring your own snacks to enjoy during the festival or to picnic and tailgate beforehand. If you’re going to one of the concerts during the Shenandoah Valley Music Festival, stay with us at The Inn at Vaucluse Spring. Relax and rejuvenate at our oasis. You’ll love walking through our gorgeous gardens and staying in our cozy rooms and cottages. Indulge in our luxurious amenities including starting your day off right with a delicious breakfast! After a good night’s sleep and our 3-course breakfast, you’ll feel refreshed and ready for the next adventure. The property once belonged to Revolutionary War Captain Strother Jones in 1785, giving it an incredible history that has since been restored and preserved. Enjoy High ceilings, original mantles, and gleaming heart pine floors under thick Oriental rugs. 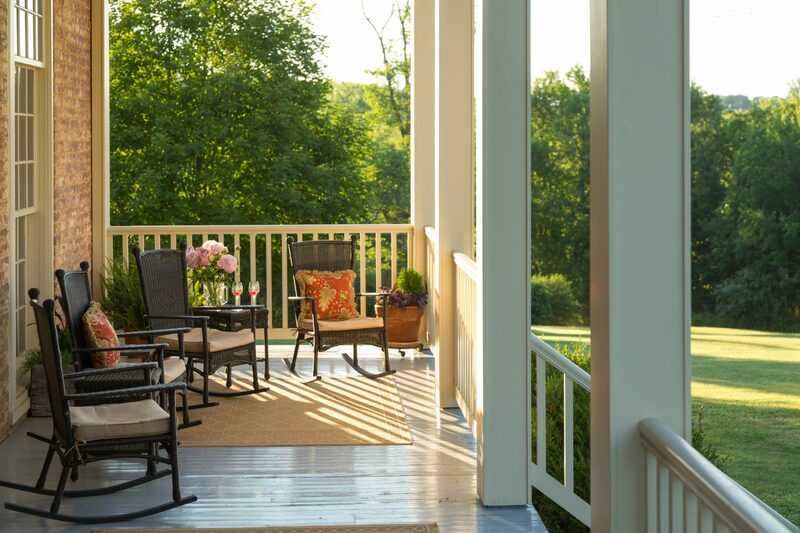 Outside, the front porch of the Manor House draws many to its row of rockers for the peaceful views of the Blue Ridge Mountains and Shenandoah Valley. Book your stay today!